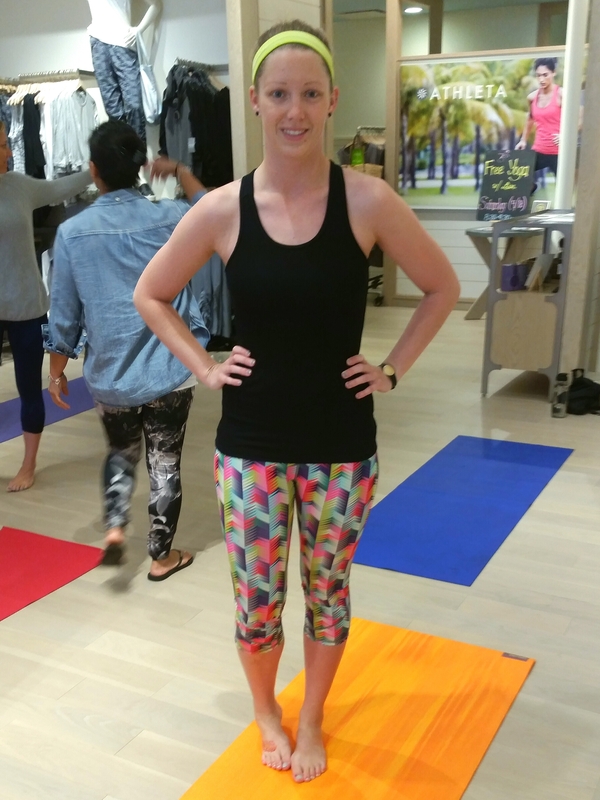 Yesterday I had the privilege to attend a special blogger event put on by Athleta, the high-end activewear brand associated with GAP and Banana Republic. The brand graciously invited me and about a dozen other SoCal health, fitness, and lifestyle bloggers for a private yoga and shopping event at their store up in La Jolla/UTC, to network and learn more about the Athleta brand! It’d been forever since I went shopping for some new clothes, and with summer coming I was excited to see some of the new trends coming out and try to find comfy, yet nice-looking tops for work, or a new pair of yoga pants. 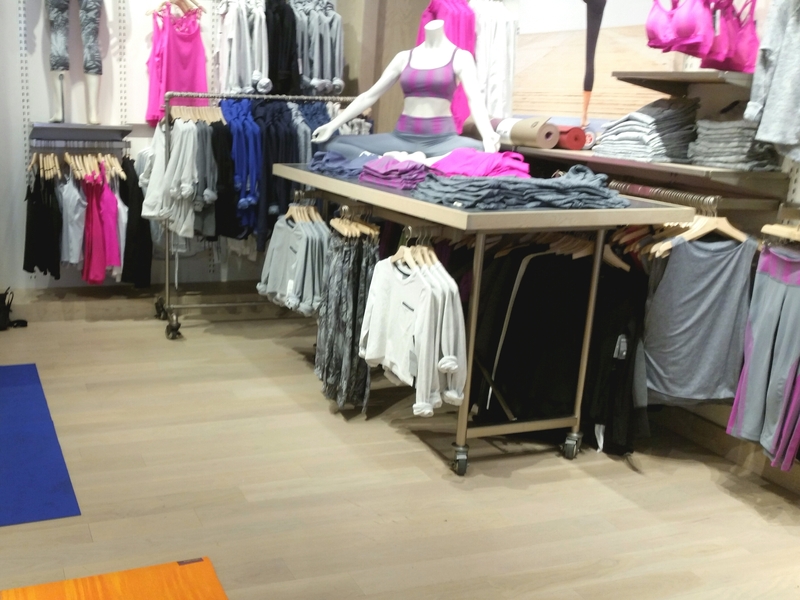 Then the awesome ladies at Athleta presented us with a generous gift of 50% off any three items in the store! We got started with some light breakfast refreshments, tweeting (of course) and then got our mats out and ready for an hour of guided yoga. Our teacher was great and had some smooth downtempo electronic music playing to set the mood, so I was already a big fan! I’m usually a bit nervous before yoga because I don’t practice often, but as we got into some of the harder poses and going through the flows more quickly, I could tell that my hard work at the gym is really starting to pay off. By far, the hardest parts of the class were when we did the core exercises (seen below) and anything that involved standing on one foot, as I still had a pretty sore ankle from my run the night before! The teacher must have known that several of us were runners, because we did some awesome poses for strengthening and opening up the hips and obliques. But I digress – the clothes, yes, the clothes. Athleta isn’t just a brand for workout clothes and yoga pants – they toe the line of casual streetwear as well and want to make women feel empowered, both in and out of the gym. Basically all of their pieces could be worn equally well for various types of exercise, or conversely just out running errands or weekend brunch, without giving you that “fresh out of high school gym class” look. I’m lucky to be working in a super-casual office environment now, which is why I particularly like the crossover style of Athleta’s clothes. I love to be comfy, but often feel like activewear brands just look too much like gym clothes to actually wear out. Rather than the typical assembly line of tshirts, shorts leggings you tend to find when looking at other athletic brands, this store offered several different kinds of tops, pullovers, windbreakers, etc. in diverse cuts and materials. In addition to the designer look of the clothing, I loved that they offered the best of both worlds – bright neons and patterns vs. more neutral color schemes like black and grey, navy and army green. So I went in looking for a pair of yoga pants and ended up with much better; something sleek and comfortable I can actually wear to work and not seem like I came in my pajamas! Basic black jogger pants in a light material, plain black 3/4 sleeve top (a staple I’ve been needing for awhile) and an awesome hooded pullover top with mesh-like detail and a cowl neck all made me feel so on trend, like a white female version of Kanye. I also found some capri-length yoga pants that I just had to have for the upcoming warm weather. Who wants to wear sweatpants in sunny San Diego, right?! In addition to the four functional pieces I bought, all of us bloggers were also hooked up with brand new colorful Athleta yoga mats (now I don’t have to borrow Cam’s!) and swag bags featuring Athleta ribbon hair ties, nutrition bars, latest Athleta catalog and more. They really outdid themselves! HUGEST of thanks to Athleta at Westfield UTC for having us all in, hosting breakfast and making it like Christmas morning! They host free fitness classes every weekend at the mall, for those of you who are local and interested. I know there are a ton of activewear brands to choose from these days – but when you’re looking to pay for quality, Athleta has a unique and fashionable edge and certainly gives the other name brands a run for their money. I’d highly suggest you check them out and get decked out for the spring and summer! Pingback: Get Elevated with Ganja Yoga | Herbs & Spices.